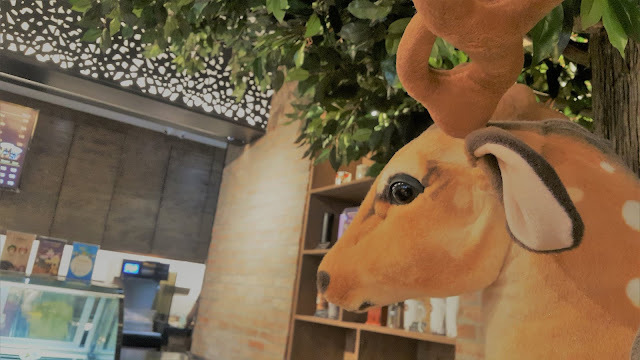 Another Korean inspired cafe is here! 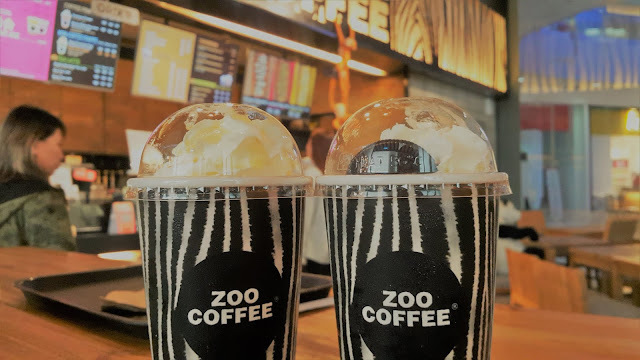 Zoo coffee, with a friendly animal, themed coffee shop gives that pleasant vibe that's perfect for your meetings, cozy lunch outs or just a nice friendly date. 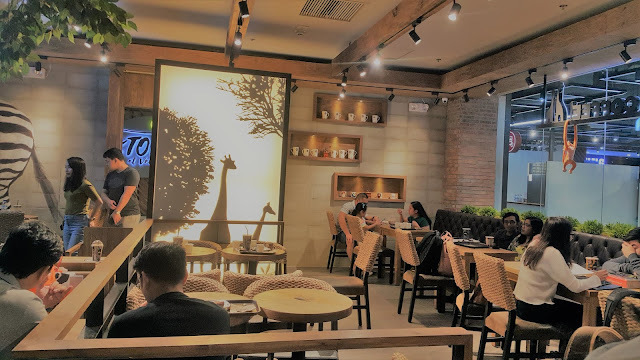 If you are planning to try some of their items, gear up a little 'cause it's pricier than the regular cafes but if you are for the Instagram worthy place, then it's a must on your list. 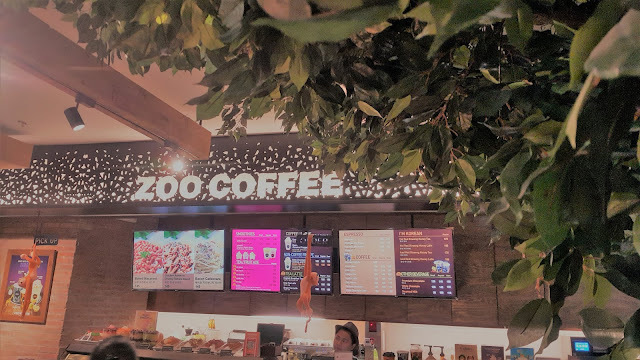 Zoo coffee would surely give you that 'Korean feel' once you enter. From the background music to the aesthetics of the place, you wouldn't mind staying hours in this cafe. Interiors include the obvious animal prints that are actually a part of their logo. The zebra skin color. Aside from their cute cups, they also sell items that have their brand on. 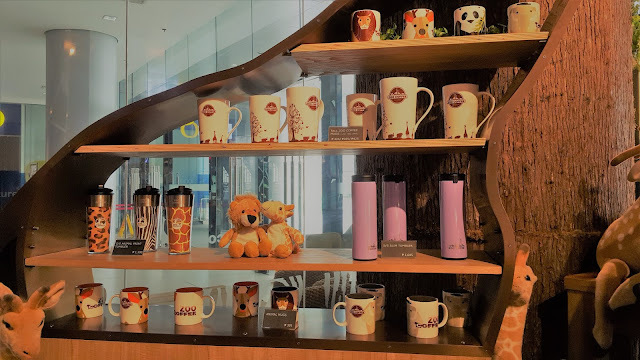 I love the cute animal prints of the tumblers and mug! I'm just not sure if they also sell the cute displayed stuffed animals which I'd like to purchase one if they do! 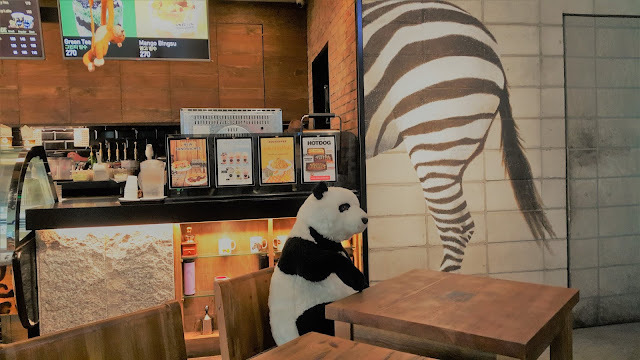 Moreover, you can find pandas, deer, tigers, and monkeys everywhere! Oh! 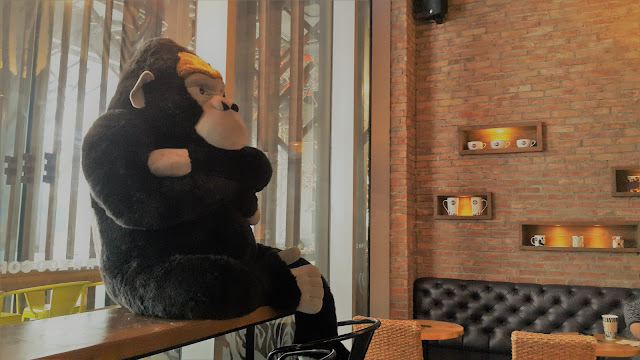 and yes, here's this gigantic orangutan waiting for you to sit beside him! 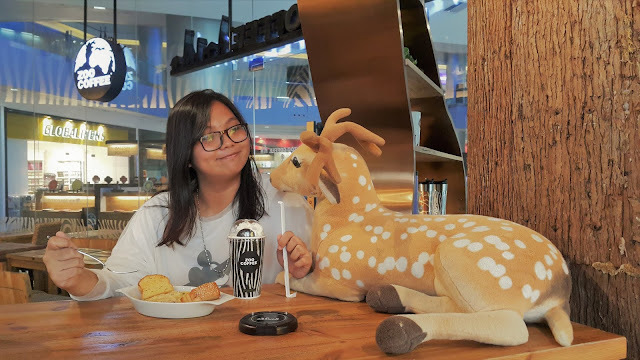 I decided to date out with this deer because it's so cute and I have no date! Lol. 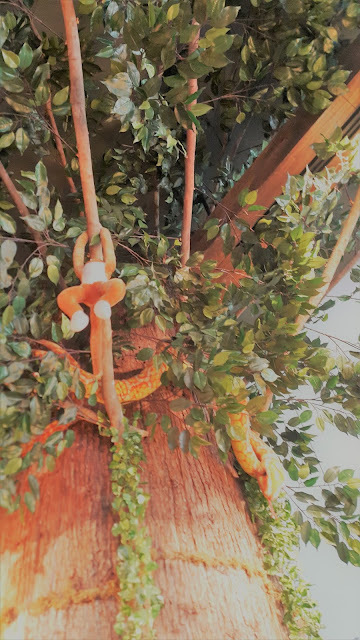 On top of us are monkeys placed on their in-store tall synthetic trees! 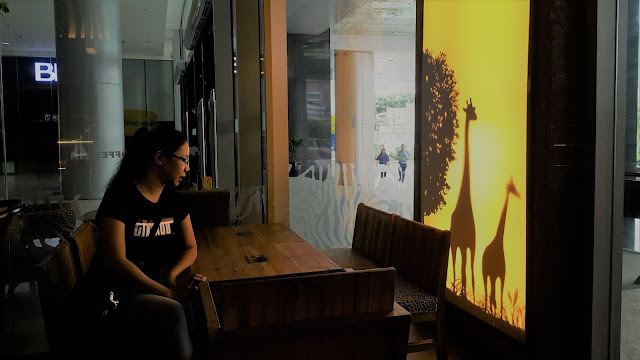 One of the focal designs that I saw in Zoo cafe is this giraffe yellow lighted shadow background that would surely take your attention. 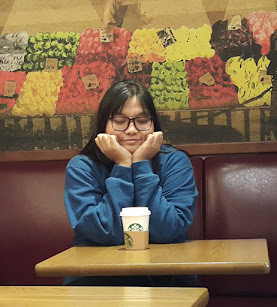 It's not so instagrammable if you'd like to include a person on the photo but if you plan to take a photo of it on its own, it would be a good subject. 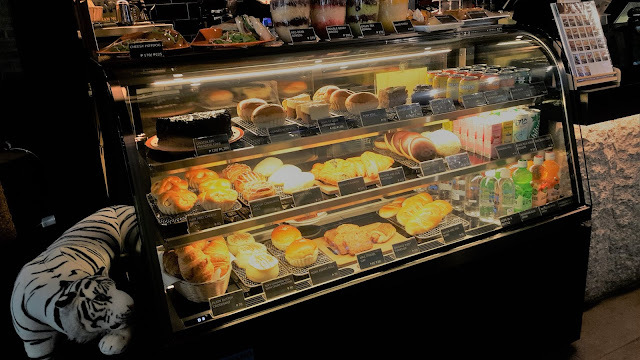 There are lots of choices on their display and you can also check on their menu for the drinks and other kinds of pasta or pastries. 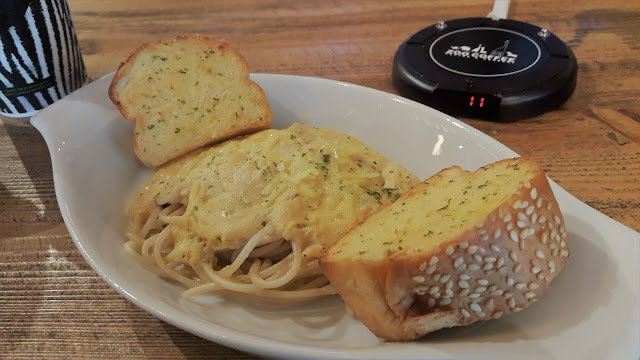 We also ordered salted-egg pasta that comes with toasted garlic bread. Super satisfied with the taste but it's on the expensive side if I'm gonna compare it with other cafes that I tried before. They also have 'budget type meals' wherein food and beverages are partnered on a lower price. Ranges from about P180-P300. However, there's only a limited selection of drinks. 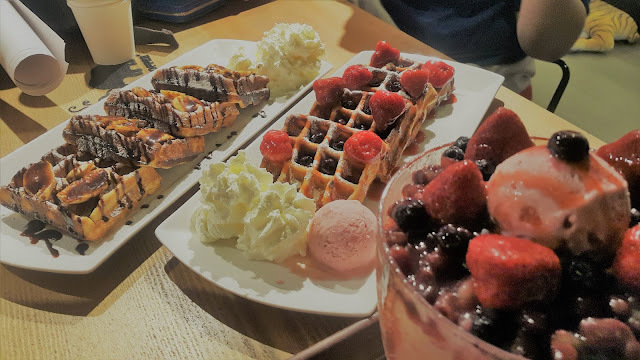 Aside from the beverages and the ones mentioned earlier, they are proud to offer their 'patbingsu' that comes in extremely huge servings. 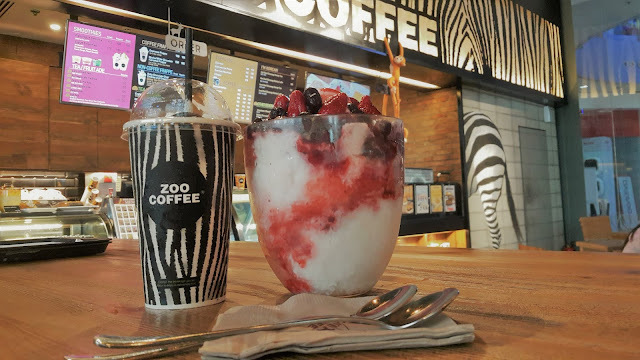 We tried the double berry bingsu (P285) and it's good for 3-4 people. The height of the bowl is as tall as their medium sized drinks. Check the comparison on the photo. 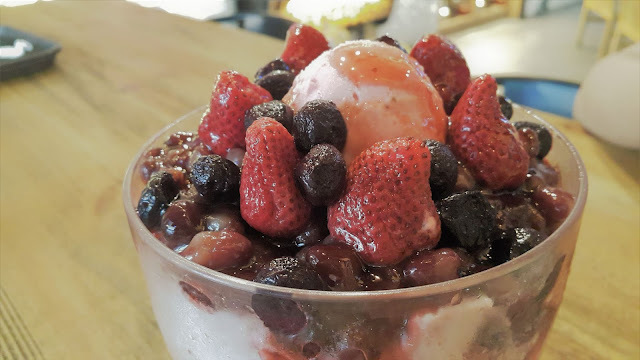 Here's a closer look on the double berry bingsu. The taste of berries is pretty strong if you are not a fan so if you plan to order this one, you better mix it first. Bingsu is supposedly eaten without mixing but we had a hard time with the tangy taste of berries. Their waffles taste the best by the way! The choco banana and even the strawberry are super flavorful. Unfortunately, the mango flavor is out of stock so we never had the chance to try it! 2. If you'll order bingsu, I suggest that you don't order drinks anymore, unless it's hot. 3. If you are after the photos, make sure to bring cam as they have yellow lights and it's hard to take photos with that type of light. Here's another one in Ayala Malls Vertis North! 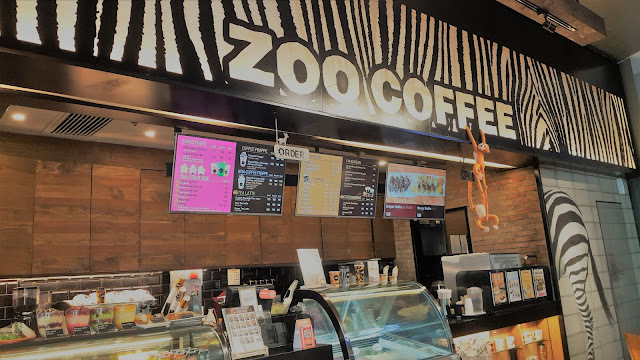 It's must see coffee shop if you'd like to take lots of indoor zoo themed photos! 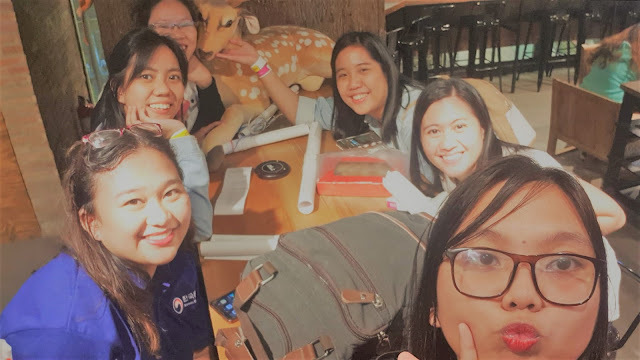 Will surely comeback soon!